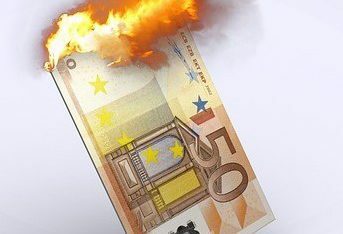 Here follow my instructions for the burning money experiment. This is in my mind really fascinating. First time I did this with my kids, they wanted to do this experiment over and over again. 🙂 Remember to start the experiment with a hypothesis, what do you think will happen? Go outdoors, preferably in the evening when it gets dark to be able to see the flame properly. Mix 1/2 cups isopropyl alcohol with 3/4 cups water in a glass. Mix properly with a spoon. Dip the piece of paper into the mixture. Use the pliers to hold the paper in one corner above a paper plate, due to it may drip mixture from it. Take the lit candle and put the piece of paper on fire in the opposite corner. What happens with the piece of paper? How does the paper feel afterward? You can dip the piece of paper into the mixture several times. Please try this experiment with either more or less isopropyl alcohol in the mixture and see how it affects the piece of paper. WARNING: Isopropyl alcohol is flammable. If eye contact: Rinse gently with water for several minutes. Remove any contact lenses if possible. Continue to rinse. Keep out of reach of children. In case of ingestion, see medical advice immediately. Click the link to get to my Kids Christmas Calendar for more experiments.